Paralegal | What's On My Nightstand? The Paralegal program is celebrating its 4th anniversary with its annual ice cream social on Wednesday, May 13th at 4:30 pm at the Skokie Campus. You can learn more about the program there. If you want more information about the paralegal profession, why not check out some of these books from our collection? “Becoming a Paralegal provides everything needed to know about entering the exciting field of law: how to choose the right training program, short courses versus four-year degrees, what it takes to succeed in the field, the various areas in which paralegals can specialize, career advancement opportunities, and more. This exciting title details all aspects involved in paralegal work” (descriptive content provided by Syndetics). “The Paralegal Professional: Essentials provides a solid foundation in concept knowledge and analytical skills. Using chapter opening vignettes, ethical perspectives, advice from the field, and chapter exercises, it develops real-world skills needed to be successful in a paralegal career. This edition features new video case studies and Paralegals in Practice boxes that bring the world of the paralegal closer to the classroom. Its continued emphasis on technology and ethics shows what it means to be a professional in the field” (Descriptive content provided by Syndetics). In addition to the general resources that will be of value to every paralegal, this guide also includes detailed information on practice and procedures for working in specialty law firms” (Descriptive content provided by Syndetics). “Like the exam itself, this comprehensive manual is known in the field for high standards of paralegal professionalism and excellence. 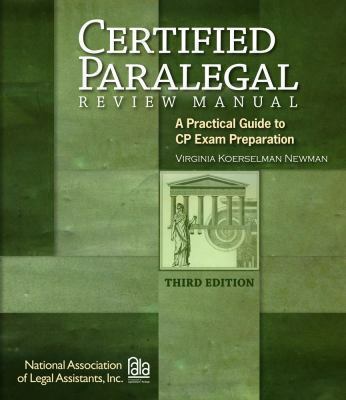 This latest edition is an invaluable resource for those preparing to take the Certified Legal Assistant (CLA) /Certified Paralegal (CP) Examination administered by the National Association of Legal Assistants. The manual first describes the CLA/CP exam in detail so that readers are well-prepared for the essential elements of the test—including aspects of grading, retake policy, eligibility requirements, preparation for the exam, group study, and taking the examination. It then delves into specific content areas of the test including legal terminology, communications, administrative law, and bankruptcy law. This third edition thoroughly covers each section of the exam with extensive outlines, examples, facts, and charts for review. Sample tests, study tips, and overall best practices are provided to fully prepare test-takers on their way to success” (Descriptive content provided by Syndetics). “This thorough, easy-to-use handbook helps the reader select a law career best suited to one’s interests, training, and aptitude, where a law degree is not a requirement. Each of the fifty careers profiled in the book includes interviews with people currently in that job; sample responsibilities; typical education and skills necessary; and further resources to help find out more, and how to enter the field. 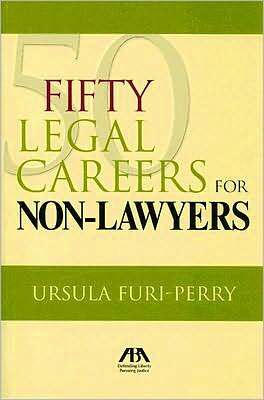 This new book from the American Bar Association is a must-have for anyone planning their future in law” (Descriptive content provided by Syndetics). “Although there are other books that discuss conducting legal research, Finding the Law: Legal Research for Librarians is unique in that it is aimed at librarians, library science students, and paralegals rather than at law students. Because it assumes that its audience already understands the research process in general, this book will allow readers to grow professionally, learning new skills that will be used in the day-to-day practice of librarianship as it applies to our legal systems. Topics covered include the origins of legal publishing; an overview of the U.S. system of law and government; issues related to the U. S. Constitution and Treaties; and the activities of the legislative and executive branches. Consideration is also given to researching state legal systems, emphasizing the differences to conducting research for the federal systems. The book concludes with an examination of the legal issues faced by librarians, publishers, and book distributors” (Descriptive content provided by Syndetics). “A comprehensive and accessible text, specifically written for paralegal students, Introduction to Law for Paralegals provides an in-depth introduction to the key concepts in the American legal system, research and analysis of legal material, as well as legal ethics and substantive law. Supported by strong pedagogy and a critical-thinking approach to edited cases, the material is engaging, well-written and highly teachable. The Fifth Edition has been updated to reflect new cases and changes in statutory law, with new reasoning exercises to challenge and engage students. Updated Internet references and Web-based exercises are also included. The rich Appendix now includes the full text of the U.S. Constitution. Features: Comprehensive, accessible overview of all key concepts covered in an introduction to law course. Highly teachable style, with detailed Instructor’s Manual, Test Bank and PowerPoints. In-depth coverage written specifically for paralegal students, including: The role of the paralegal. Sources and classification of law. Structure of the court system. Overview of litigation Basics of legal analysis, research, and writing. Legal ethics and substantive law. Critical-thinking approach introduces students to the study of law. Use of edited cases to teach students how to read and analyze the law. Engaging hypotheticals, examples, and well-designed questions” (Descriptive content provided by Syndetics). * Paralegals may not practice law except as provided by state law and with the direct supervision of an attorney.